The Disability Insurance Solutions Plan was designed specifically for your blue and gray collar clients. This plan comes with many benefits already included such as recurrent disabilities, transplants benefits, presumptive benefits and waiver of premium. With limits of $100,000 per month or more and participation limits up to 75% for personal disability and 100% for business uses, you will be able to properly protect your clients’ incomes. When a young man lost one of his legs in a construction accident, he was not sure what the rest of his life would hold for him. A tough sort of guy, he knew that he wanted to conquer the problems that now faced him. With a fascination for magic, he worked hard to learn a new skill and started performing magic at parties. Strapping on a wooden peg leg and dressing like a pirate, his new career was launched. Problem: Who would insure this man’s income? One leg, dressed like a pirate and performing magic: This is not your typical disability insurance risk! This man knows how quickly disability can change ones life. He wanted to insulate himself from the peril of another unfortunate disability. 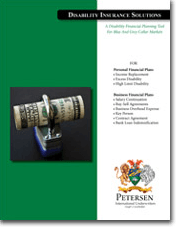 Petersen International Underwriters was able to get him the coverage he needed. Many people working in blue collar and gray collar occupations find it difficult to obtain sufficient amounts of disability income replacement with adequate benefit periods. Disability insurance is invaluable for any person in any occupation; a plan like this one will ensure that your blue collar and gray collar clients can continue their standard of living despite a debilitating accident or sickness. Make sure your clients are sufficiently covered with PIU’s Disability Insurance Solutions Plan.